Nature's Technology - Feedback - Nature's Technology Landscape & Design, Inc. Description of Work: Complete re-landscaping, following landscape plan drawn up by landscape architect. 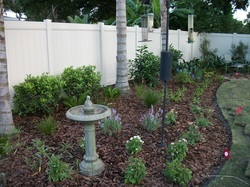 Customer Comment: Nature's Technology has designed and installed landscaping for our last two homes. At our first property they also provided suburb maintenance. Everything they do is customized to the client's preferences. Sandy is so great to work with. She is extremely knowledgeable, budget conscious, and able to meet her deadlines. Sandy, and the team who creates the drawings, have an excellent eye. Between them, no detail is left out. Both jobs were started in a timely manner. They finished on the day she stated at the beginning of the installation, and within the budget too. It has been my experience that her employees have been courteous, professional, and hard-working. We have been very happy with Sandy, her crew, the quality and variety of plant materials, structural elements (rocks, stone paths, pots, etc. ), and the other service providers she recommended (irrigation, and tree trimming companies).